Boasts deployable fortifications and free post-release updates. You wait ten years for a Left4Dead successor to come along, and then four swarm you from all sides within the space of a few months. We’ve already had the much-improved Vermintide II earlier this year, while Deep Rock Galactic’s Early Access adds a shade of space dwarf shenanigans to the structure defined by Valve’s co-op classic. There’s even GTFO lurking in the shadows of Q4, quietly hoping to be the Aliens game that Colonial Marines certainly wasn’t. 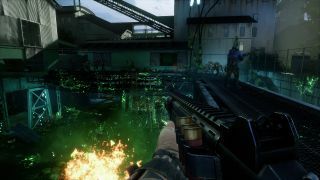 Right now though, there’s Earthfall, a high-intensity co-op shooter which switches out shambling zombies for scuttling aliens. The game is set in the verdant forests of the Pacific Northwest, and sees players working together across ten missions of extraterrestrial-splattering action. There’s a little more to Earthfall than a straightforward run-and-gun, however. Players can deploy barricades and gun-turrets to establish defensive positions on the fly, while new weapons can be created via the use of 3D printers. The latter smacks of being a little gimmicky, but the idea of custom fortifications seems like a smart way to get players to work together. There’s a launch trailer below which, frankly, doesn’t do the best job of selling the game. But if you’re up for some more cooperative gunplay, you can pick up Earthfall right now on Steam for £24. Developers Holospark also have plans to support the game beyond launch, and those future updates won’t cost you nothing more than the time to play them.